National Player of the Year candidate Grant Williams is just the 10th player in conference history to win SEC Player of the Year in back-to-back season and was the first since Arkansas’ Corliss Williamson did so in 1994 and 1995. Williams was also tabbed first-team All-SEC after finishing the regular season as the top scorer in the SEC with 19.3 points per game. He has been one of the nation’s most versatile and reliable players this season, averaging 7.5 rebounds, 3.1 assists, 1.4 blocks and 1.1 steals per game while shooting 57 percent from the field and an impressive 82 percent from the charity stripe. Tennessee’s all-time series with Iowa is tied at 2-2. All four meetings took place at neutral sites. The Vols are 23-34 all-time against current members of the Big 10. Rick Barnes owns a 3-1 head coaching record vs. Iowa, with all meetings coming during his tenure at Texas. Barnes is 29-29 against current members of the Big 10. Stand as Tennessee’s 31st win of the season. That would tie UT’s program record for wins (2007-08). It would also tie for the most wins in a season by a Rick Barnes‘ coached team. His 2007-08 Texas squad went 31-7. Give the Volunteers a .500 all-time record in NCAA Tournament play (22-22). 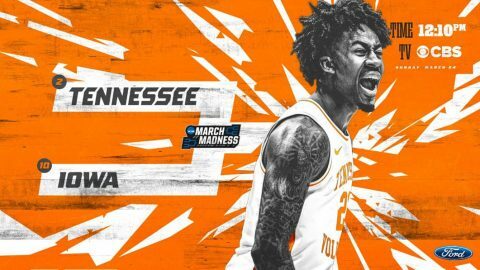 Make Tennessee 4-0 in NCAA Tournament games played in Columbus, Ohio. These teams last met in the First Four in 2014. Tennessee rallied from a 12-point deficit to win in overtime. This year’s Vols have posted three wins over teams ranked in the AP top five. That ties the 1976-77 squad for UT’s most wins over top-five opponents in a single season. Two of Tennessee’s four losses this season have come in overtime, and all five were away from home against opponents that are seeded No. 5 or better. Tennessee’s final average home attendance of 19,034 ranks fourth nationally. Tennessee is 56-14 (.800) since the start of last season. Sunday should mark Grant William’s 100th consecutive start. A win by the Volunteers on Sunday would give Tennessee its eighth all-time Sweet Sixteen appearance—and its sixth since 2000. Rick Barnes could become the 11th or 12th head coach to lead a third Division I program to the Sweet Sixteen. If the Vols defeat Iowa on Sunday, possible Sweet Sixteen opponents next Thursday are No. 3 seed Purdue and No. 6 seed Villanova. Those teams meetSaturday at 8:40p.m. ET (TNT). Tennessee has advanced to the Elite Eight only once in program history, defeating Ohio State and National Player of the Year Evan Turner to advance to the Regional Final in 2010. Iowa (23-11) earned an at-large bid for the NCAA Tournament out of the Big Ten Conference and advanced to the second round with a victory over Cincinnati Friday. Four different players are averaging double-figure scoring for the Hawkeyes this season in Tyler Cook (14.6 ppg), Luka Garza (13.1 ppg), Jordan Bohannon (11.4 ppg) and Joe Wieskamp (11.1 ppg), giving Iowa a balanced scoring attack. Cook, who is also the team’s leading rebounder at 7.8 boards per game, was tabbed a second-team All-Big Ten selection by the media and a third-team selection by the coaches. Bohannon earned third-team accolades, Garza was an honorable-mention selection and Wieskamp earned a spot on the league’s all-freshman team. Bohannon leads the Hawkeyes in assists (117) and has led the Big Ten in free-throw percentage each of the last two seasons. The junior guard also is a threat from beyond the arc, where he’s connected on 73 3-pointers this year. The Vols are making their 22nd all-time appearance in the NCAA Tournament. The Big Orange own a 21-22 (.488) NCAA Tournament record. The Vols are 1-0 in the “First Four,” 13-6 in first-round games, 6-8 in second-round games, 1-0 in third-round action, 1-6 in regional semifinals, 0-1 in regional finals and 0-1 in the now-defunct regional consolation round. This is the program’s third NCAA berth in the last eight years and its second under fourth-year head coach Rick Barnes. Tennessee’s 22 NCAA Tournament berths tie LSU for third-most among SEC teams. In the last dozen years (2009-2018), among SEC programs, only Kentucky (29) and Florida (18) have won more NCAA Tournament games than Tennessee (10). Tennessee is 1-0 in its lone previous matchup against a No. 10 seed in the NCAA Tournament. The Vols haven’t faced a No. 10 seed since 1980, when the Big Orange defeated Furman, 80-69, to advance to the Round of 32. Tennessee has recorded 30 wins for the second time in program history. This also is the first time the Vols have won at least 25 games in back-to-back seasons.